Deciding on a name was a tedious project for us. It felt like there was no discernible progress after weeks of churning through long nights on the whiteboard. As fate would have it, we choose HomeHero (among the list of others were HeroCircle, HeroNation, SilverCircle, and SideKick) and inherited a legacy of David and Goliath, specifically Bob beating Home Depot. Bob Harris started a company called HomeHero based in Florida with the goal of creating an online marketplace for contractors such as house cleaners, painters and plumbers. It was a brilliant idea, but the year was 2008, and Bob was 71 years old. Bob was persistent and he obtained the trademark to the name HomeHero and started working on his idea. About 6 months into building his online marketplace, Bob got a letter from Home Depot ordering him to immediately shut down his business and cease all operations under the name HomeHero. Home Depot was about to release their debut fire extinguisher called the HomeHero and didn’t want Bob and homehero.com to cause any confusion to consumers. Bob is not the type of guy who gives in easily as the marketing and legal team at Home Depot was about to find out. 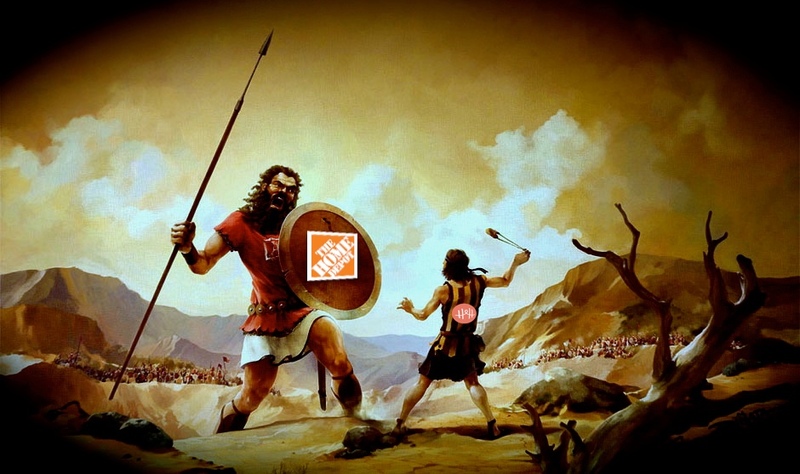 For the next 5 years, a battle to the likes of David and Goliath ensued between Bob and The Home Depot. Eventually the stress, time commitment and accumulating legal debt became too much for Bob and he decided to write an email to conceding the domain and the trademark to the evil toilette selling conglomerate. Late in the evening just as he began writing the letter, Bob got a call from his lawyer saying Home Depot discontinued the fire extinguisher - the case was dropped. He felt the rush from a hard fought victory like an ultramarathon runner at the finish line, and he felt depleted. A month later, May 2014, I sent Bob an email asking if the domain was available. He took a few days to think about it, and responded telling me he would agree to sell me the HomeHero trademark on the condition that I never buy from Home Depot for the rest of my life. If you walk into the HomeHero Santa Monica office you will see old Home Depot fire extinguishers on the walls. These are a constant reminder as to the value of persistence and an enduring legacy of triumph in the face of what seemed sure defeat..